New Year's resolution is anyway pretty much hard to keep and if yours is especially about getting back into shape then you'll need proper workout clothes for it. 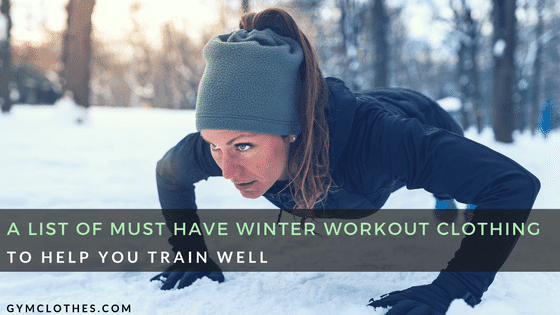 What you wear for your winter workout can be the difference between a boost and a buzzkill, hence it is important to consider the proper clothing before you head out to train outdoors. For starters, you must keep yourself warm. Muscles loose heat during the winters making them contract which can lead to tightness and pain. Hence, your goal should be to wear clothes that will keep your body warm and muscles relaxed. You can even get affordable workout apparel from a private label clothing manufacturer. These types of tights are meant for high intensity training which also keeps the leg muscles compressed. In this way you can avoid sudden muscle contractions during the winter making it less susceptible to inflammation and discomfort. A great base layer top should feel like a second skin without being too restrictive. You'll find such quality assured private label fitness apparel in odorless and four way stretch technology which will eventually make your movement while training all the easier. A thick, heavy jacket is too cumbersome when you want to get active outdoors. You can find lightweight jackets in ripstop fabric that will protect you from the harsh wind and not be a burden as well with its weight issues. If your hands are uncomfortably cold, your winter workout will be a torture no matter what you have on your entire body. Hence it will be advisable to invest in a pair of gloves that has device touch technology so that you can do your work while training. Talk about multitasking! A warm and well- fitted headband should be your go to accessory for keeping those tresses at place and to also keep dripping sweat at bay from your face. Warm, comfortable socks are a must for winter workout. The fabric should be of a breathable material and sweatproof too, to combat the formation of fungal infections and mildew smell. Choose those types that have extra cushioning at the heels so that it can absorb the impacts. Therefore, it is advisable to invest in such winter appropriate activewear so that you can train well in the freezing cold temperatures. Retailers can get such quality assured and stylish workout clothes from the best of private label fitness clothing manufacturer at reasonable rates.